The following diagrams show some triangles with missing interior and exterior angles. Scroll down the page for step by step solutions on how to find the missing angles in triangles. How to find the missing interior and exterior angles of a triangle? We can use the property that the angles of a triangle add up to 180 degrees. Subtract the given angles from 180 to get the missing angle. Ex: Could a triangle have the given angle measures? Since all three angles add up to 180 degrees, you can find the missing angle by subtraction. Find two missing angles that are equal. 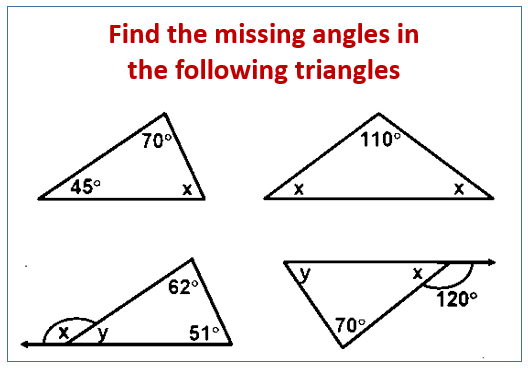 How to Find the Missing Angle in a Triangle? How to find a missing angle in a triangle?